Well a bit late for Wednesday, so Happy Boxing day. My worktop contains my rather limited haul of craft bits, but Birthday on Saturday so hoping for some more goodies then. 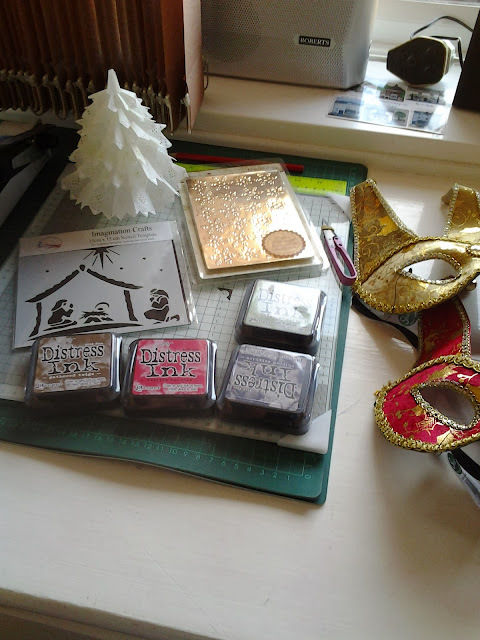 Trouble is OH refused to buy me much in the way of craft stuff 'because there are cupboards full already'. Of course, but I still need new things to inspire me and the stuff in the cupboard is wonderful insulation on the outside wall! 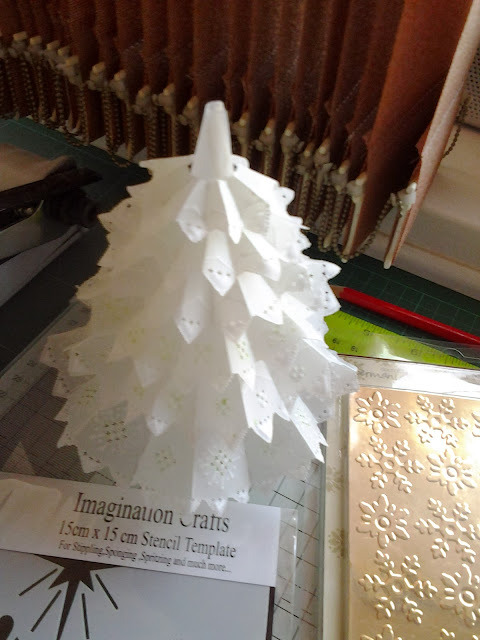 So there are only a few distress ink, a mask and an embossing folder and at the back is a beautiful pergamano Christmas tree I was given by Margaret from Glitter and glue. Better pic of the tree here, it is very beautiful and must now go back downstairs and take pride of place on the mantelpiece. On the right of the main pic are two masks for the masked ball we are going to on New Year's Eve in Remagen in Germany, at the end of a five day holiday, so won't be here next week so will wish you all a Happy New Year now, and then go and make turkey soup. PS if you have just arrived at this page and are wondering who 'all' means, just pop over to Julia and look at all the desktops on show there and you will see who the 'all' are, my wonderful WOYWWer friends. Happy boxing and hope you had a Merry Christmas too! I'm a nut for trees. Your white beauty is stunning. Sorry you didn't get many crafty supplies, but I like your rationalization that it's all good insulation! Happy Boxing Day, merry belated Christmas, and happy day after WOYWW from #1. Happy belated Birthday, and Happy Boxing Day to you too, and WOYWW! I didn't get any crafting stuff but I buy so much, if my DH tried to get any he would get it wrong! Love the tree, it is gorgeous! Hi again Mrs D, the angel is an Inkadinkado stamp, one of the few I kept when they wouldn't give me permission to sell my makes in the shop! It is called Angel trail I think. I stamped in white and used white embossing powder. Can only give them to friends and family and it got a reprieve when someone wanted an angel card - I can do commissions one of a kind cards! Thank you for liking it, I have a couple more I stamped in a different way but didn't get to make up, maybe next year. So it is Happy (very tidy) WOYWW to you. What a fun, a masquerade! Hope your birthday is smashing and at the very least you go out and buy whatever it is that you were hoping Santa would leave you, but somehow missed. Happy late WOYWW....I'm just snooping this week. What a lovely tree! My family never buy me craft goodies, I think they dread having to clear them when I am gone so don't want any more cluttering up. The pergamano tree is so lovely and delicate. Love the masks, so fun! I don't understand the people who think we have enough stuff already. Don't they know we always want and need the latest and greatest. It isn't like we have it *all* yet. You got some fun play things though. I am liking the distress inks myself. Wow Chris you have done well what with Christmas and birthday stash, well done you!! I pray your are having a happy Holiday but must be back soon if not already :D oh and popped over to say have done a post with your lovely card on it ..